In my previous post, I have analyzed the trends in sexual networking sites. Today, I’m sharing with you a matured subject on making adult relationship. Virtually, those looking for adult relationships and over 18, I‘ve listed a few popular social networking sites where you log on and have your social life started. Some of them will give a free trial but if you want to stay on, or if you want to use all the features, you're going to have to pay. However, if you want to visit club, you can virtually now log on to Red Light Center. This is for open mind adult only. You must be above 18 years to become member of this online club. It’s free and you can download if you want to do more than just meeting people online. But you still want more; you have to pay $ 20 per month. The VIP membership lets you get naked and get down. You can't do that with the free version. You'll also have access to the VIP only clubs found around Red Light Center. 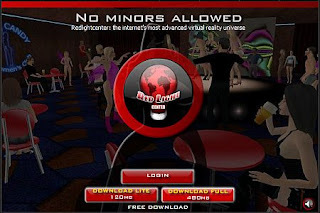 You can do the same thing with Second Life yet Red Light Center is completely adult site. So, if you are open minded, don’t just shy away from Red Light Center!